See current and expected tuition charges for Bryan College of Health Sciences, and just how these charges contrast to the U.S. average. See how fees and tuition at Bryan College of Health Sciences match up to other U.S. colleges and universities and see how to properly get prepared for potential college tuition growth. The following table shows how Bryan College of Health Sciences compares to other colleges nationally, regionally and by state. How Much Does Bryan College of Health Sciences Charge for Tuition? In the 2017 - 2018 school year, full time students at Bryan College of Health Sciences were billed $15,190, prior to adjustments for financial need. $14,410 was the price tag on tuition. $780 was the charge for fees. Regrettably, this college doesn't offer any tuition discounts to students who live in state. Fees and tuition prices cited here don't include room and board, which can drive up your expenses. Bear in mind a lot of students have financial aid and scholarships that lower their total cost. Look at the table below to find 2017 - 2018 academic year costs. How much does Bryan College of Health Sciences cost part time? For more information, visit Bryan College of Health Sciences Part Time Tuition & Fees. There continues to be a growth of 3.8% in Bryan College of Health Sciences tuition and fees for out-of-state students in the past five years. Tuition expanded by 4.0% and fees expanded by 0.0%. This school year, students can expect to pay $15,767 if the growth keeps up. Because of price growth, the total expense of a four-year Bryan College of Health Sciences degree would be $66,756, and the total expense of a two-year degree would be $32,134, which doesn't include extra costs such as books, transportation, and room and board. 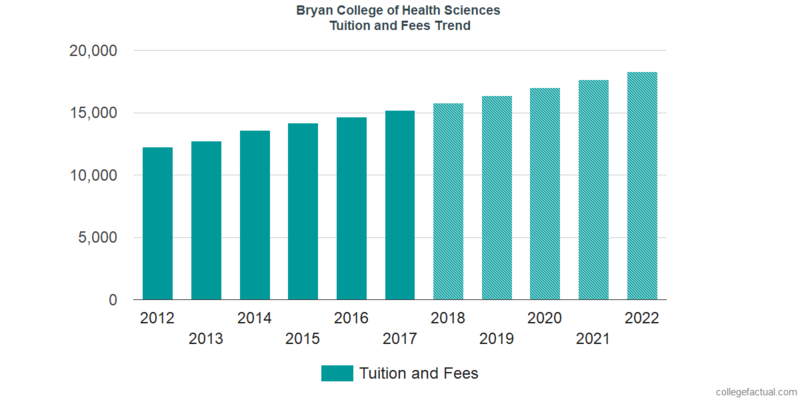 The following chart shows projected future tuition and fees for undergraduate students at Bryan College of Health Sciences. Be aware of just how much the tuition and fees are increasing yearly. At a lot of colleges students will wind up spending more money on their last year of school compared to what they did for their first. Find some answers to the most frequently asked finance questions on college.